Oxygen and silicon are the two most common elements in the earth's crust, together constituting an estimated 74.32 weight % and 83.77 atom % of crustal rocks (Mason and Moore, 1982). Thus, it is not surprising that SiO2 or silica, is the most abundant oxide on the earth's surface. In his widely cited survey, Clarke (1904) calculated that quartz alone comprises 12.0% of the crust by volume, ranking behind the mineral groups that include feldspar (59.5%) and amphibole/pyroxene (16.8%). Consequently, research into the silica system is motivated foremost by the prevalence of silica in man's immediate environment. The ubiquity of silica in igneous, metamorphic, and sedimentary rocks has led earth scientists to seek its uses as an indicator of large-scale geological processes, ranging from mountain-building to meteorite impacts. In industry, quartz has long played a prosaic but essential role as an inexpensive and relatively inert constituent of concrete aggregates, and modern electronics technology still relies on quartz oscillators. Silica phases also have played a prominent role in our understanding of the solid state. Physicists first discovered optical activity in crystals and the existence of soft modes during their investigations of quartz. Many scientists have written substantial reviews documenting the importance of silica in the earth, materials, and physical sciences. 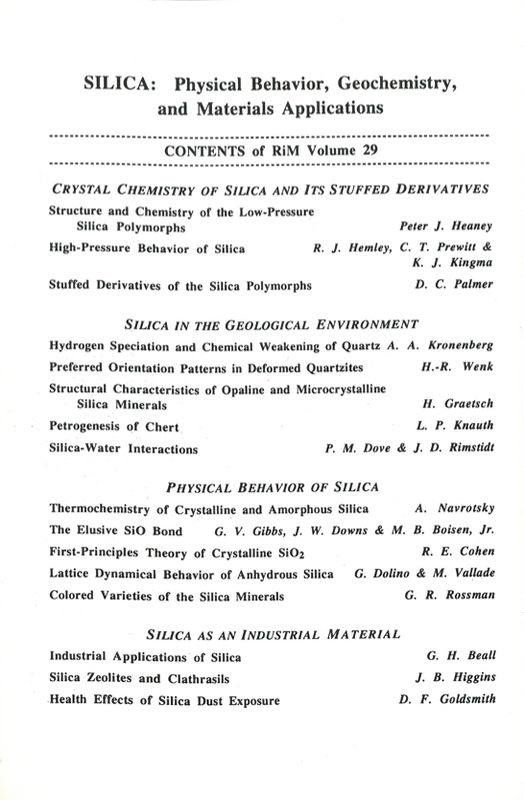 Notable among these are Robert Sosman, who followed his Properties of Silica (1927) with The Phases of Silica (1965), and Clifford Frondel, who devoted the third volume of Dana's System of Mineralogy (1962) exclusively to the silica minerals. These treatises continue to serve as encyclopedic resources for those interested in silica, and their historical analyses and descriptions of mineral varieties, morphologies, and localities will remain forever useful. Nevertheless, the past three decades have witnessed a first-order expansion of our knowledge of the silica system, and it is time to provide an updated silica review. The present volume focuses on the most recent developments, and it is intended to supplement rather than replace the earlier works of Sosman and Frondel. Chapters 1 through 3 describe the crystal structures and phase transitions of silica and its stuffed derivatives. Recent studies of the low-pressure polymorphs quartz, tridymite, and cristobalite have demonstrated unusual superperiodic phases and other anomalies associated with structural transformations (Chapter 1). Spectacular progress in multianvil and diamond cell technologies has made the high-pressure regime accessible, revealing new transitions in the coesite and stishovite systems as well as the phenomenon of pressureinduced amorphization (Chapter 2). Stoichiometric substitution of cations within the frameworks of both low- and high-pressure polymorphs produces a dizzying variety of derivative compounds that are of geological and industrial importance (Chapter 3). Chapters 4 through 9 bridge the relationship between the microstructural character of real silica minerals and the behavior of silica in the geological environment. Incorporation of small amounts of H dramatically weakens quartz exposed to stress (Chapter 4). Consequently, tectonic pressures may lead not to brittle fracture but to the production of high densities of dislocations and preferred orientation in polycrystalline quartz (Chapter 5). The low pressures and temperatures in sedimentary settings may promote the crystallization of highly defective silica phases that are frequently metastable (Chapter 6); through diagenetic processes, these minerals anneal to macrocrystalline quartz (Chapter 7). The nature of the surface structure of quartz strongly influences the mechanisms and kinetics of silica dissolution in aqueous fluids (Chapter 8). 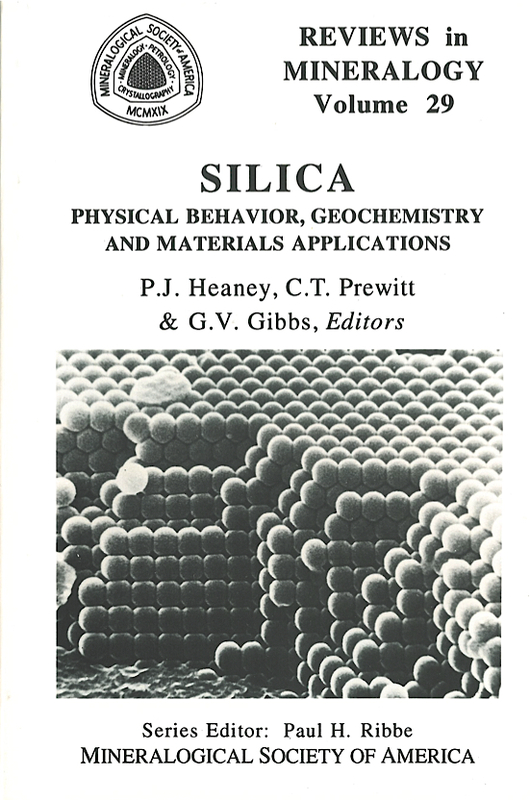 Chapters 9 through 13 treat the basic physical properties of the phases of silica. Recent calorimetric studies of some of the more unusual silica compounds have added insight into the stability of the silica framework (Chapter 9). Quantum mechanical considerations of the Si-O bond have yielded a fundamental understanding of the bond lengths and angles within the polymorphous silica system (Chapter 10). Calculations based upon first-principles theory have achieved significant success in explaining and predicting silica transitions at high temperatures and pressures (Chapter 11). Spectroscopic analyses of silica (Chapters 12 and 13) have revealed vibrational behaviors in response to variations in temperature, pressure, and composition that have deepened our understanding of the dynamic interactions within the silica structure.